Ever since Apple introduced the larger-screened Apple iPhone 6 and the Apple iPhone 6 Plus phablet, buyers who left the iPhone for the larger screens available with Android have come running back to the fold. Apple sold a whopping 74.5 million iPhone units in the calendar fourth quarter of 2014, and the company has narrowed the gap in global smartphone market share with Samsung. During today's media event in San Francisco, Apple CEO Tim Cook displayed a rather generic looking graph, showing that the iPhone has had a 35% increase in demand year-over-year. 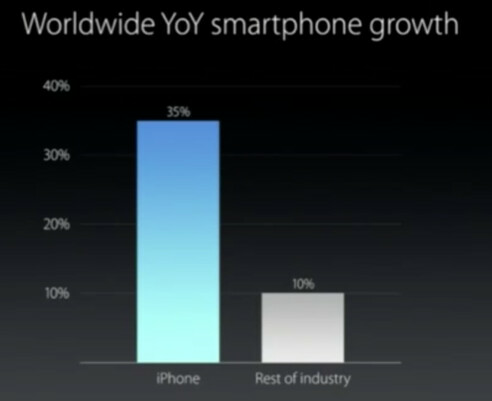 That compares to the 10% growth that the rest of the industry is achieving on an annual basis. Just the other day, we told you that the Taiwan supply chain expects Apple to ship 70 to 80 million iPhones this quarter. Apple obviously expects to continue to outpace the rest of the global smartphone industry during the remainder of this year. The big question for Apple is whether the new features and upgrades made to the Apple iPhone 6s and Apple iPhone 6s Plus will be enough to keep this strong momentum running through 2016. After all, since there are no changes to the sizes of the screens on the two new iPhone models, Apple is counting on the changes made on the inside of the new phones. Do they have a source on that one? The source is Apple, of course. Bro its called marketing. When you don't have compelling product that's what you do. You make stuff up to sell it. Given Apple's brand that's what they are good at. Though I hate them as a tech company but when I'll start my business I am going to follow their marketing strategy for sure. They are not tech company, they are good marketing company for sheeps. Tech companys nowdays makes screens starting 1080 as a minimum. And if they would have added another gig to these devices then the keynote would have been extended for another few hours just to talk about how they did it and all other marketing BS. But amount of cash Apple has they can surely come up with some really new products. But I guess they left that to other tech companies like Sony, Samsung, LG & Moto. Apple mentions RAM only when talking about.... Macs ? They took more time anooncing iPad mini 3 than talking about RAM in iPad Air 2.
they can sell old tech for same price as top tech companies, so why spend more on better tech, so way more profit. about that os, well, its very simple, that probably explains their market, why there are people sitting 20h next to shops to get next iphone.. but specs are just a joke, starting from screen ending with half day battery for 1k phone. iPhone is the best phone on the market. You forgot to put /s at the end. Like I predicted CambodianPatriot is behind this account reverse trolling. I ve been saying that since day one. People would buy a turd if you put an Apple logo on it. Just saying. You can't even access the file system on an iPhone -- a basic computing function. This doesn't make the iPhone a smartphone at all. Just a phone. well.....they have to brag of how great of a company they are, how unique there products are and how people just buy their new products once they are launched.....doesn't matter if it has something really good & innovative or not !! At a time of 4k display Apple still lingering around with 720p. Looks like their end times are near. How are those iPad numbers doing?